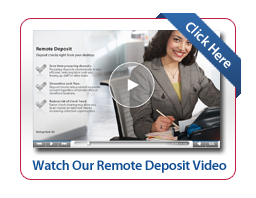 Scan your checks from the comfort of your own office and get your deposits to the bank faster. No travel, time, or gas money. By connecting a compatible scanner to your PC and the Internet, an electronic file of your scanned items will be submitted electronically through a secure connection to Heritage Bank. Need help with your Merchant Account?